Leukemia cutis is an uncommon cutaneous eruption that may be difficult to diagnose. In the vast majority of patients, there is a known history of leukemia at the time of the skin manifestations. However, leukemia may have its initial manifestation in the skin, in some cases with simultaneous bone marrow involvement, or less commonly, in the absence of simultaneous marrow involvement. (In these cases, the cutaneous eruptions have been called extramedullary myeloid tumors (1)). In one series, approximately 38% of patients had cutaneous findings at the time of bone marrow diagnosis (2). In other series, anywhere from 3% to 7% of patients had cutaneous lesions prior to detection of marrow involvement (3). Patients with all types of leukemia may demonstrate cutaneous lesions. It has been reported in 2% to 3% of patients with acute myelogenous leukemia (4). Cutaneous involvement is less common in patients with acute lymphoblastic leukemia (5). Chronic myelogenous leukemia patients have skin manifestations in 6% to 20% of cases (6). The incidence ranges from 4% to 20% in patients with chronic lymphocytic leukemia (7). The clinical manifestations of leukemia cutis are protean. In some cases, the disparate clinical appearances correlate with the subtypes of leukemia involved and the systemic complications caused by these types of leukemia. For instance, hemorrhagic lesions are commonly found in the subtypes of leukemia that are associated with coagulopathies (such as acute promyelocytic leukemia), but are rarely seen in patients with chronic lymphocytic leukemia. Tumor nodules may occur in patients with any subtype of leukemia, but are most commonly seen in those with chronic myelogenous leukemia (Figure 5.1). In other patients, diffuse erythematous papules and nodules correlate with diffuse infiltrates of neoplastic cells throughout the dermis. The etiology for bullae that have been reported in rare patients is less well understood. Some types of leukemia have more specific findings, such as gingival hyperplasia associated with acute myelomo-nocytic leukemia. 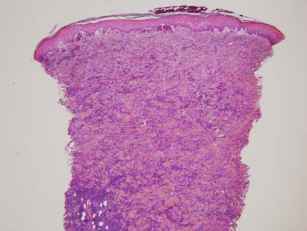 The histologic findings in leukemia cutis are varied. In most cases, there is a diffuse infiltrate of atypical hema-topoietic cells throughout the dermis (Figure 5.2). In some cases, the neoplastic cells appear in such density as to form dermal tumor nodules. More commonly, however, the cells are dispersed individually throughout the dermis. The cells show little tendency for cohesion and percolate between splayed collagen bundles. 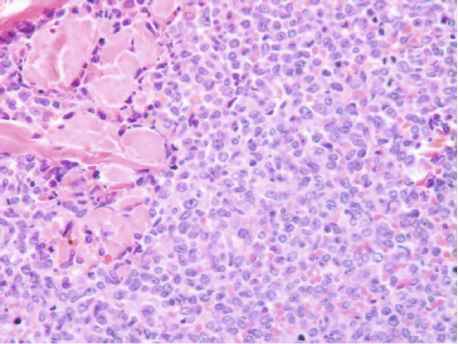 In some cases, there is a predilection for aggregates of leukemic cells surrounding the peri-eccrine vascular spaces (8). The cytologic features of the infiltrating cells vary with the type of leukemia. In acute myeloid leukemias, large, immature precursor cells are present (Figure 5.3). These cells are readily identified with routine sections in most cases. In some cases, a chloroacetate esterase stain or the use of an anti-myeloperoxidase antibody may be helpful in identifying characteristic cytoplasmic granules. Similarly, the chronic myeloid leukemias feature immature myeloid forms coursing throughout the dermis. In these types of leukemia, abundant mitoses and individual cell necrosis are common features. This subtype of leukemia is usually straightforward to recognize in the skin. Figure 5.2. Low power photomicrograph of dense dermal infiltrate in leukemia cutis. Note the Grenz zone typical of this condition. throughout the dermis. Abundant mitotic activity and individual cell necrosis are commonly seen. These cells are very difficult to classify based upon routine sections or special stains; however, correlation with cytometric studies is helpful, and in most cases, the patient's prior history makes the diagnosis straightforward. Chronic lymphocytic leukemia (CLL) may also occur in the skin, both in patients with long-standing disease, and as an initial manifestation. In these cases, a de novo diagnosis is difficult to make. 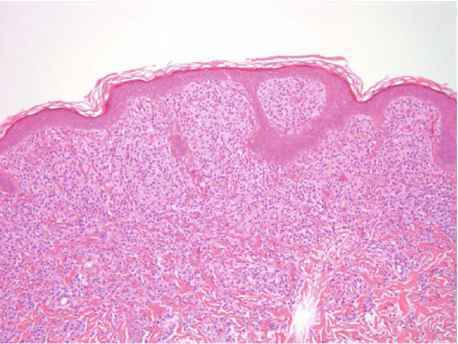 The histologic findings include only a monomorphous population of relatively small and unremarkable lymphocytes within the dermis. The key observation is that the usual heterogeneity of cell type is absent, as is the usual variation in lymphocyte size and shape. Clonality can be ascertained in most cases, if the diagnosis is entertained based upon routine sectioning. Some investigators have noted a tendency for the neoplastic lymphocytes in CLL to comprise the immune response underlying primary keratinocytic neoplasms or infectious processes (9,10). This may be the first clue to the diagnosis in some patients. The prognosis for patients with cutaneous involvement by leukemia is generally poor. It suggests widely disseminated disease in most cases. However, for patients with CLL, there is no evidence that the presence of neoplastic lymphocytes within the dermis serves as any type of adverse marker and long-term survival has been seen in these patients. Figure 5.3. High power detail of neoplastic infiltrate. Note the large atypical cells with vesicular nuclei and surrounding myeloid precursors with eosinophilic cytoplasm. sive and appropriate treatment ofthe bone marrow-derived process is the appropriate regimen. Even in patients with no evidence of leukemia on bone marrow biopsy, close clinical follow-up is essential and treatment is indicated in some patients.